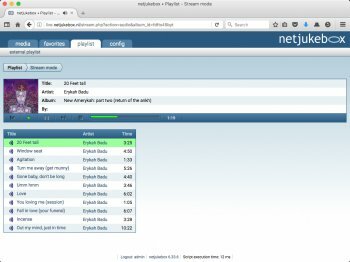 netjukebox is a web-based media jukebox for MPD, VideoLAN and Winamp/httpQ. It features real-time MP3 streaming from different audio formats. Download single tracks or a whole album in one zip file. It is also possible to batch transcode the whole music collection to another format or bitrate without touching the original files. For more information look at the netjukebox website. Just tried this out. Easy to use and works really well. Well done open source project. Too Bulky looking, no mention of Winamp Plugin Support like Shoutcast. I'll stick with the classic Winamp and do my Internet Radio Streaming.